The Consumer Price Index for All Urban Consumers (CPI-U) increased 0.2 percent in July on a seasonally adjusted basis after rising 0.1 percent in June, the U.S. Bureau of Labor Statistics reported today. Over the last 12 months, the all items index rose 2.9 percent before seasonal adjustment. The index for shelter rose 0.3 percent in July and accounted for nearly 60 percent of the seasonally adjusted monthly increase in the all items index. The food index rose slightly in July, with major grocery store food group indexes mixed. The energy index fell 0.5 percent, as all the major component indexes declined. The index for all items less food and energy rose 0.2 percent in July, the same increase as in May and June. Along with the shelter index, the indexes for used cars and trucks, airline fares, new vehicles, household furnishings and operations, and recreation all increased. The indexes for medical care and for apparel both declined in July. The all items index rose 2.9 percent for the 12 months ending July, the same increase as for the period ending June. 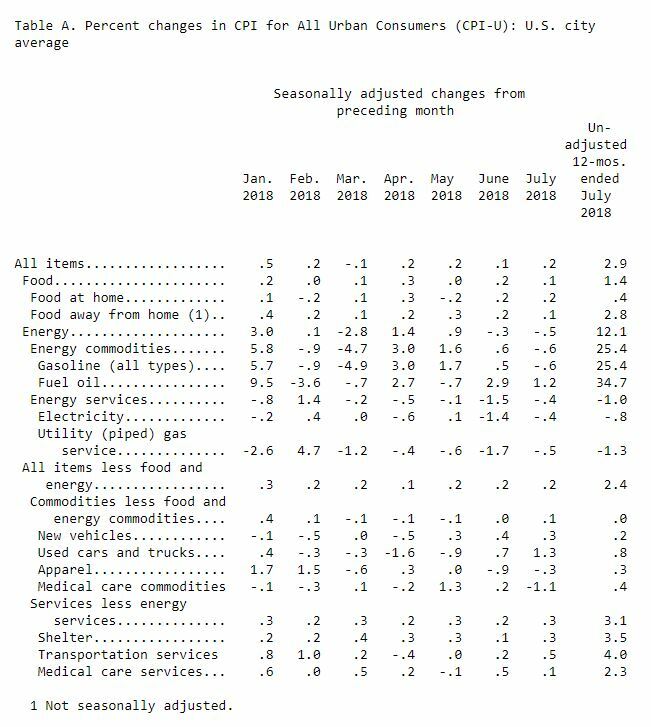 The index for all items less food and energy rose 2.4 percent for the 12 months ending July; this was the largest 12-month increase since the period ending September 2008. The food index increased 1.4 percent over the last 12 months, and the energy index rose 12.1 percent. The food index rose 0.1 percent in July after increasing 0.2 percent in June. The index for food away from home rose 0.1 percent, while the index for food at home rose 0.2 percent in July, the same increase as the prior month. Three of the six major grocery store food group indexes increased, with the index for fruits and vegetables rising 1.0 percent as the index for fresh vegetables rose 1.9 percent. The index for meats, poultry, fish, and eggs increased 0.3 percent and the index for other food at home advanced 0.1 percent. In contrast, the index for dairy and related products fell 0.6 percent in July after rising 0.7 percent in June. The index for cereals and bakery products also declined in July, falling 0.2 percent after rising in June. The index for nonalcoholic beverages was unchanged in July. The food at home index increased 0.4 percent over the past year. Four of the six major grocery store food group indexes rose over the span; the index for meats, poultry, fish, and eggs and the fruits and vegetables index both rose 0.9 percent over the last 12 months, the largest increases among the groups. The indexes for dairy and related products and nonalcoholic beverages both declined over the past year. The index for food away from home increased 2.8 percent over the past 12 months. The energy index fell 0.5 percent in July after declining 0.3 percent in June. The indexes for gasoline, natural gas, and electricity all declined modestly in July. The gasoline index fell 0.6 percent in July after rising 0.5 percent in June. (Before seasonal adjustment, gasoline prices decreased 1.4 percent in July.) The electricity index fell 0.4 percent, and the index for natural gas fell 0.5 percent, its fifth consecutive decline. The energy index increased 12.1 percent over the past year, as the gasoline index increased 25.4 percent. The index for fuel oil increased 34.7 percent over the last year. In contrast, the electricity index fell 0.8 percent, and the natural gas index declined 1.3 percent. The index for all items less food and energy increased 0.2 percent in July. The shelter index rose 0.3 percent in July following a 0.1-percent increase in June. The indexes for rent and owners’ equivalent rent both rose 0.3 percent, the same increase as in June. The index for lodging away from home increased 0.4 percent in July after falling in June. The index for used cars and trucks increased 1.3 percent in July, and the index for airline fares increased 2.7 percent after falling in each of the prior 3 months. 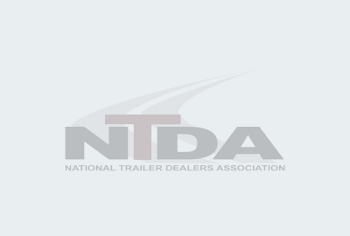 The new vehicles index rose 0.3 percent, its third consecutive increase. The index for household furnishings and operations also rose in July, advancing 0.3 percent, and the recreation index rose 0.2 percent. The medical care index declined in July, falling 0.2 percent. The index for prescription drugs fell 1.0 percent in July after rising in each of the last 3 months, and the physicians’ services index fell 0.2 percent. In contrast, the hospital services index rose 0.4 percent in July. The apparel index declined in July, falling 0.3 percent, and the index for personal care was unchanged. The index for all items less food and energy rose 2.4 percent over the past 12 months, the largest 12-month increase since the period ending September 2008. The shelter index rose 3.5 percent over the last 12 months, and the medical care index rose 1.9 percent. The indexes for used cars and trucks, apparel, recreation, and new vehicles all posted increases of less than 1.0 percent over the past year. The Consumer Price Index for All Urban Consumers (CPI-U) increased 2.9 percent over the last 12 months to an index level of 252.006 (1982-84=100). For the month, the index was unchanged prior to seasonal adjustment. The Consumer Price Index for Urban Wage Earners and Clerical Workers (CPI-W) increased 3.2 percent over the last 12 months to an index level of 246.155 (1982-84=100). For the month, the index was unchanged prior to seasonal adjustment. The Chained Consumer Price Index for All Urban Consumers (C-CPI-U) increased 2.7 percent over the last 12 months. For the month, the index was unchanged on a not seasonally adjusted basis. Please note that the indexes for the past 10 to 12 months are subject to revision. The Consumer Price Index for August 2018 is scheduled to be released on Thursday, September 13, 2018, at 8:30 a.m. (EDT). U.S. import prices increased 0.6 percent in March, the U.S. Bureau of Labor Statistics reported today, following a 1.0-percent rise in February. Both the March. The Producer Price Index for final demand rose 0.6 percent in March, seasonally adjusted, the U.S. Bureau of Labor Statistics reported today. Final demand prices.